An equestrian portrait. A chestnut stallion with a jockey up before a landscape with race course. 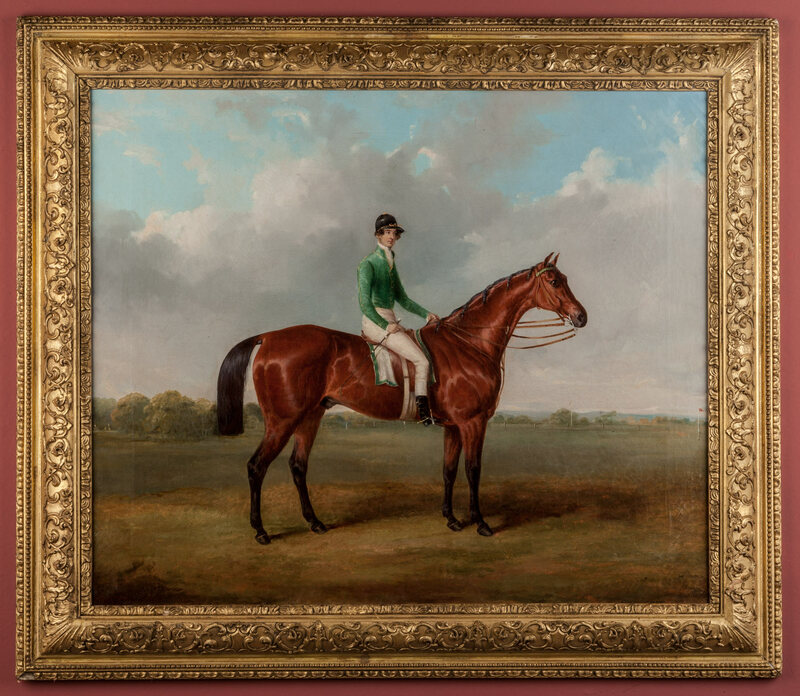 The jockey in a green jacket with gold trim; the race horse with plaited mane and cheek snaffle, popular for race horse's at this time. Signed and dated J. Maiden 1840. Painted in oil on canvas (prepared by Robersons, London) and within the original fine, gilt gesso frame. Joseph Maiden (1813-1843) was born in Bury, Lancashire and is thought to have been sent to Manchester to study under Henry Calvert. He painted sporting scenes and landscapes and despite his short life established a considerable reputation for himself. He exhibited at the Royal Manchester Institute in 1832 and 1841.